To make your shopping experience at Shelving.com even easier, we’ve created kits for some of our most popular chrome wire shelving configurations to help you get the storage you need even faster. 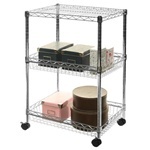 Our wide inventory and diverse selection allows us to offer one of the largest selections of chrome wire shelving anywhere, including unique sizes and styles you won’t find anywhere else. A perfect storage solution for pantries, garages, basements, and anywhere else you need to maximize storage with minimal space, our commercial-grade shelving can hold up to 800lbs of distributed weight. For extra convenience, add casters and other shelf accessories to keep your storage mobile.